I decided to break this out from the big thread. 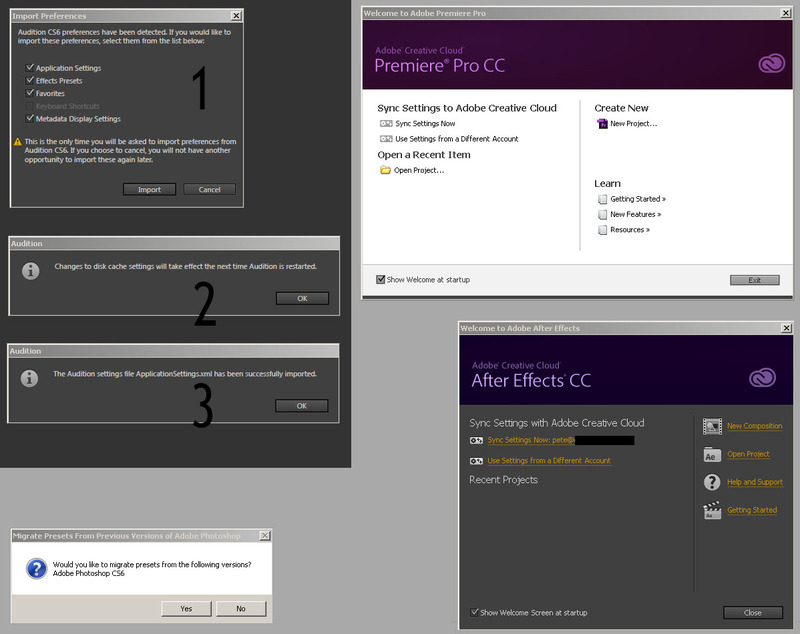 I was using Premiere Pro CS6 installed via my Creative Cloud account for the past year. I installed the CC update this morning, but it hasn't brought across my effect presets, keyboard preferences or export types. Pete Bauer mentioned that he was given an option to import this; I've just reinstalled and there's no option. There are options to synch your settings to and from the Creative Cloud for Premiere CC, but no option that I can see to pull settings from CS6. Have anyone got any thoughts on this? Have I just to start plundering round and trying to manually copy settings from my old Premiere? OK, I haven't managed to find a way to do this automatically, so I copied the settings manually from CS6 CC. I'll feel wick if someone shows me an easier way! This is only something to consider if your settings weren't copied in to CC automatically. Back up all your settings folders before you destroy them! Go to: My Documents - Adobe - Premiere Pro - 6.0 - copy the Layouts, Styles, and Templates folders from here to the new Profile-CreativeCloud- folder. Copy this to the Profile-CreativeCloud- folder, as above. Paste the Presets folder in there. Go to the Profile-CreativeCloud- folder, as above. Paste the Settings folder in here. Locate the appropriate ".kys" file(s). Mine is mb.kys. Copy the file(s). Go to the Profile-CreativeCloud- folder, as above, and open the win subfolder. Paste the .kys files into the win sub folder. I think that's pretty much it. You may have to restart Premiere. From now on, your settings can be synched to the cloud, and the pain is over. (See attached screen grabs of the various dialog boxes -- Audition was by far the most detailed, with 3 successive dialogs). Although this isn't a particularly big deal for me personally, I don't feel Adobe ignoring this issue for a major release is defensible. Looks like that's correct, Pete. I just ran Photoshop CC for the first time and was offered the option to migrate settings. I love the idea that settings are in the cloud now, and I never have to worry again.